I’ve been a fan of PfaP for some time and try to take requested supplies whenever I go to Africa on safari. This time I was thrilled to see that Ol Donyo was requesting supplies for the anti-poaching rhino rangers. I took 96 batteries, 3 “torches” (aka flashlights) and a used Nikon CoolPix camera (along with some school supplies). 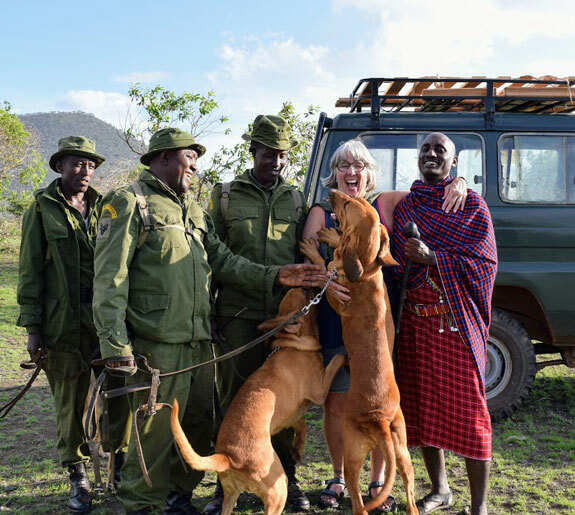 I was fortunate enough to be able to go out with the tracking dogs for a demonstration one afternoon and went to visit a ranger outpost the next morning. They took us around to show us their camera traps as well as various signs of the endangered black rhino (no rhino though). They are sponsored by Big Life Foundation and are doing important and dangerous work. I was thrilled to be able to help them in a small way through my participation in Pack for a Purpose.